Truth for Fiji - Will FAG & the dictator return their bribes? Will FAG & the dictator return their bribes? Sources have reported that the Casino incident will be interesting to watch. Especially as the illegal Attorney General and the dictator have already taken and spent the money they received in bribes from One Hundred Sands Limited. One hundred Sands has not started building their casino but the bribes have already been spent. 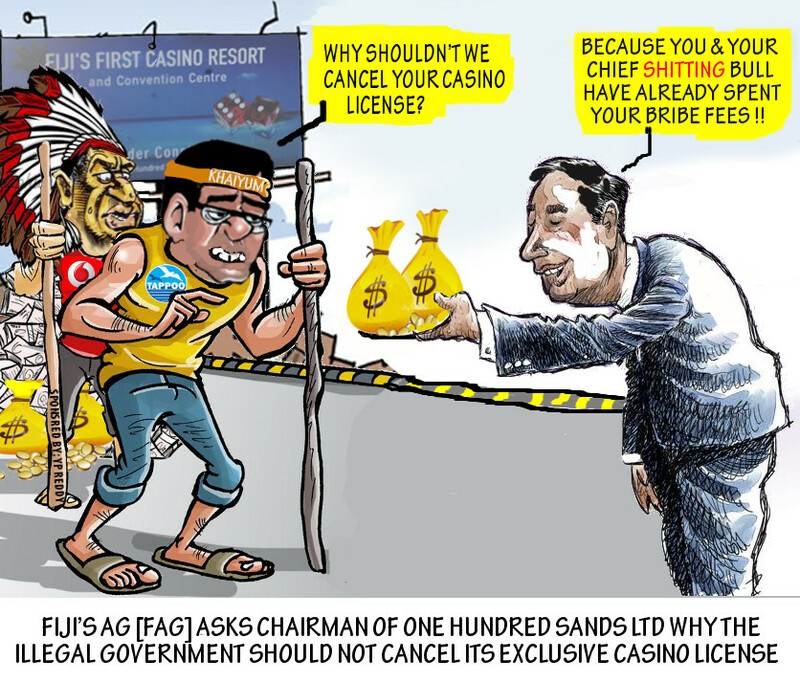 And now we see FAG (Fiji's AG] talk tough by asking the chairman of One Hundred Sands Limited why the illegal Government should not cancel its exclusive casino license. FAG also stated that One Hundred Sands Ltd's response will be assessed in the best interests of the "Fijian" people. This is another lie. We all know that FAG only does things that are in his best interest - which is corruption, theft of Fiji's resources, staying in power so that he and his family and friends can "milk" Fiji for as much as they can steal. The interests of the dictator Bainimarama is only highlighted if FAG's hold on power is threatened, otherwise its just the standard multiple salaries and free trips abroad for the dictator to embarrass Fiji internationally. However, FAG states that his dictatorship will not hesitate to cancel the license if One Hundred Sands Ltd can not demonstrate that construction of the new casino will begin soon, to the agreed-upon standards and specifications. Does this mean that FAG will return the money that he and Bainimarama took in bribes? Not likely. So our sources say that we can expect more fancy talk over the matter from FAG but no real action against One Hundred Sands Ltd.
FAG continues with his rehearsed set of lies stating that the deal was done through a very transparent process. Unfortunately, as we and the world already know, FAG's definition of transparency is a one-way-mirror that only he, bainimarama and their corrupt supporters can see through. The Auditor General's report is still muzzled, if it is not already destroyed. Yes, this is another set of false and fancy words that FAG has rehearsed. The reality is that the decision for tenders is based on a very corrupt process, which has allowed companies like Vodafone, Tappoo, YP Reddy, Solanki and individuals like the Shameem sisters to get government contracts. A well known example is Vodafone Fiji, which uses this corrupt tendering process to force Government departments to use their more expensive and poor quality services. This is a fact. The auditor general's report will provide proof that khaiyum and bainimarama received kick-backs from Vodafone. Vodafone Australia and UK know of this but are more interested in the profit margins. For 15 years Vodafone knowingly robbed the people of Fiji. Then when competition arrived they could not compete. So their chairman Ajit Godagoda went to the dictator telling him that all government departments MUST use vodafone. Companies and government departments, who have limited budgets, opt for a more cost effective and higher quality service. Vodafone can not meet these standards so they must resort to corrupt practices. In return Vodafone spies on its customers' calls, text messages and emails for the military goons.